Tone 13 is the Day of Ascension. Tone 13 carries us to the next Higher Step in our journey of Divine Consciousness. Every Ascension builds on the Higher Ground of the last. The Jaguar/IX trecena raised consciousness to our Gifts of Spirit. Deer/MANIK elevated our Consciousness to the Meaning and Purpose. Everything that is created holds a “reason why.” Everything we dream of creating was inspired by a reason. We grasp the Divine Power for Creation when our reason is Love, and we Volunteer to a Mission to Love Each Other. Storm/CAUAC represents the Comfort of Home as the place we run when we see a Storm on our horizon. “Home” represents the place of our Authority where we decide what thoughts we’ll allow in the door. Human is a vessel for Divinity. We were given Authority to Choose the thoughts that direct our lives. When we Choose to follow the path that was laid before us by the Creator, we will be given the Authority by Choice. Storm/CAUAC is the Day Sign of Renewal and Regeneration. The Lightning of Storm illustrates the Unbridled Power of the Creator, without boundaries, limits, or conditions. 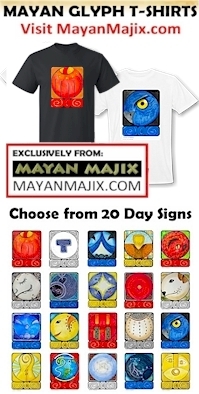 The Cherokee Day Sign is the Redbird, said to be a Sign of “lightning energy” in the sky. CAUAC is a sign of “Lightning in the Blood,” the Sixth Sense of Knowing through the body. Flint/ETZNAB raised our Consciousness to our Sixth Sense of Knowing the Truth. Our Spark binds us to the Creator and the Truth of Unconditional Love. Tone 12 is the Tone of Understanding. On Tone 12 we’re given a gift of Retrospection that allows us to draw “disassociated parts into a new functioning whole.” Tone 12 is a day when Truth sinks in. Flint serves as a catalyst for change by bringing things to a head to wipe the slate clean. Flint reveals Truth that is covered up or hidden. There will be no denying of Flint’s Truth, we’ll Know its True the moment we hear or see it. Both Tone 12 and Flint correspond with Truth as their most important Intention. Flint is a day when we are tempted to “act out of character.” The Point of Flint is to get to the Truth of our Self, and to Believe in Truth as the path of Freedom. Flint knows all the reasons we avoid the Truth. Truth often means we have to take action. Our own Truth can make us feel vulnerable, when it’s different from those around us. There are many ways that Flint can present Truth. Today Flint will clear a path forward on our Mission of Love, through a new Understanding of Truth. Tone 10 is the day of Manifestation. What is focused on with Intention becomes real with 10. Tone 10 is a Blessing and Responsibility. To Manifest anything, we have to Claim it. Wisdom/CIB is the Day Sign that reflects a mind in its Highest State of Consciousness. The glyph illustrations the mind, emanating the rays of Light as Consciousness and Forgiveness. CIB is the Day Sign that honors the Ascended Ones who preserved the Sacred Wisdom as our Spiritual Inheritance. All that we are capable to Know was made possible by the Higher Ground preserved as our Beginning. CIB connects us to the Old Ones to remind us that we all walk this same path. It takes all of us to complete the journey that transforms the Whole. The whole of our Wisdom and Consciousness was made possible by Divine Truths the Old Ones preserved for us. Tone 10 can present a challenge. We have to use our Discernment to see the change. Tone 10 is often a day when we’re presented with an old scenario, only to discover that we see it in a wholly new way. Today we see how, by following a path of Vigilance, we can discern our own Direction of Love. We’ve gained the Consciousness of our thoughts, so they can be directed by Intention. When we learn to push away our negative thoughts, we are no longer ruled by our emotions. We can follow the One Truth our heart knows when we’re cleared of the Illusions of our Ego. Tone 9 is a Peak Tone that completes our Transformation. Tone 8 and Tone 9 together, raise the Consciousness of the two sides of our Self. Tone 8 changes our Spiritual Consciousness, and Tone 9 completes the change of our Human Perspective. Tone 9 calls for Patience. There is something more to learn. Tone 9 warns of potential suffering in the future if we fail to see the Big Picture. Tone 9 presents a very important Spiritual Tool for the manifestation of our Dreams. We have to assume that Human’s Consciousness of Love is limited by our own experience and understanding. As Human, we’ll never know it all. Even our Truth will change with deeper understanding. We have to continue our Vigilant Observation with the understanding that more is always revealed. Eagle/MEN reveals the Vision of our Future. Eagle holds potential for success through its Gift of Forward Vision. Eagle is capable to see which ventures will succeed or fail. Eagle Know that whatever it can clearly see lies within its grasp. A fuzzy picture is a sure sign of failure. Eagle is an Intermediary who raises us up where we are directly connected to our own Divine Vision from Above. Eagle helps to lift our own Divine Thoughts so we can see something for our Self. Creating relies on having a clear vision of the Dream we hope to manifest. The more clearly we see the details in our imagination, the more we will Know the Dream lies within our grasp. The Eagle flies by Intuition.